The eldest Gorgon sister has made her grand entrance! Zola is here and is ready to ice anyone who stands in her way! During this event, all Reptile heroes get a 25% attack boost in PVP. Plus, her lacky, Killer Krosk has invaded the dungeons on her behalf. In addition, a special new rune is available: Reptilian runes! Similar to how Honorbound runes worked, these runes can only be equipped to Reptile heroes, but a hero equipped with these runes will get a 15% chance to stone enemies that they hit with their basic attack. We've also got PVP leaderboards for you and your guilds to tackle, with Zola tokens and Reptilian runes as rewards. Yes, Zola is a bit cheesy, but she's a true bleu blood and definitely doesn't stink in battle! We've gotten some questions about how leaderboard contributions work. You contribute points to whatever guild you are in at any given time. If you leave a guild, your contribution to that guild stays with that guild, but you will only get rewards for whatever guild you are in at the end of the event. If you are in guild A and win 10 PVP raids, guild A has 10 points. If you quit guild A and join guild B and win 5 more raids, guild A still has 10 points, and guild B has 5 points. If you stay in guild B until the end of the event, you will get whatever rewards the member of guild B get. The PVP leaderboard ends when the Zola event ends at 3pm CST on Monday, February 4th. In addition, there will be a new set of repeatable quests added to the quest log later on in the event! Lol, an hour and 10 minutes after the event is supposed to start you tell us that it is delayed. No $h1t Sherlock! Delay because you didn't earn enough money from the Zola pass. When has an event in the last 3-5 months NOT have a delay? Maybe they will give us the weekend off. It would be nice to have a weekend off... Can we have a weekend off? @Bloth the event has literally been out for 5 minutes. What is triggering you? Oh thank god. A doors event. See you all in two weeks. So is there another way to earn more tickets (other then quests)? I have done both PvP and run dungeons and gotten nothing. I mean I expect to see tickets in the shop for real money but did you really make it so there is no other way to earn them? Tickets are also obtainable via the event dungeon. 50 per run. Better start now so you can afford the 175k rune. @Joel Why can venom stack this high? Shouldn’t there be a limit of stacks that can be applied like 10? 50 stacks is just stupid. There is so many thing that need to be done it’s almost comical. The best thing that could be done and actually help the game is remove runes. It could make the game better because reptile/Barbarian shields would not be pointless due to shield piercings runes. The game is becoming less fun every day thanks to the P2W events. Why the drop of tickets is so low? Why I don't get any ticket for pvp runs? Why the UH rune in the first day bonus door is atk atk def, when you clearly said there will never be a single blue rune with double atk stat? You are really going to make a competitive event that lasts 18 days? Why now the rune for top5 just became a 4 star Elite rune, instead of the usual 5 star? We asked better rewards to get motivated to go for first, not to lower the rewards for the other tiers. 175k for the rune, 200k for tokens, and the event dungeon drops 50 per run. What is wrong with your event designing process that you think that is reasonable? Furthermore, current costs is ~$400 (US) to use a gold key on every door. Good job contributing to mass burnout and dissatisfaction with the game, your team has clearly honed that skill to perfection. Just here to spread awareness about the fact that EA heads have been working at Big Fish and Boss Fight as of a few months ago, so be sure to realize that spending money on anything Dungeon Boss related is giving money to the 100% worst company in the gaming industry. What are the stat changes for Viperia and Cobressa? Anyone figure out the hero stat updates? Bring back the hero features! That was one of the only good things you guys did. You guys think you can just slip them out without us noticing, but your wallets certainly will if you keep this up. what in the world did you do to let them hit you? I killed them all before they could hit me more than once. What is wrong with you guys @Joel? 50 per run and 175k for the rune!? This is ..... ridiculous! 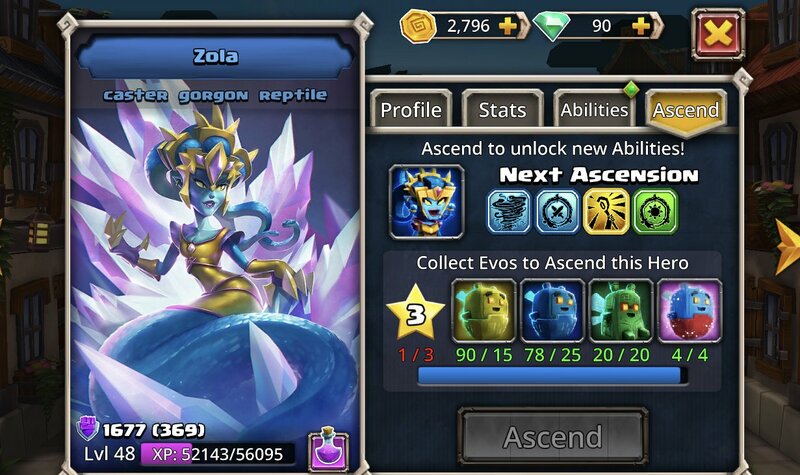 So I unlocked Zola, and it so happens that I had the evos to ascend her right away. But it won't let me? Am I missing something? I've never had this problem with any other hero. U need to 3* to 1a her, 5* to get full ascension. @BradleyGaspar See the "1/3"? It says: "f*ck you if you don't give us your monthly payment for a 3d-model within a mobilephone game".